I had a shock this morning as Mr Stitchery was leaving for work. 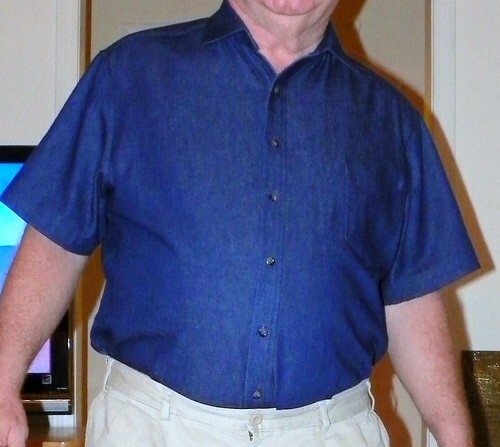 Shredded fabric was hanging from his worn sleeves and button placket. We did a quick snip with the scissors and off he went to his heavy boards of raw oak and maple wood and big, loud machines and piles of sawdust. I went to his closet to explore the state of the rest of his short sleeved work shirts and this is what I found. The worst of the lot had just walked out the door. This shot was taken after 8 months of wash and wear weekly. He loves his custom made shirts. 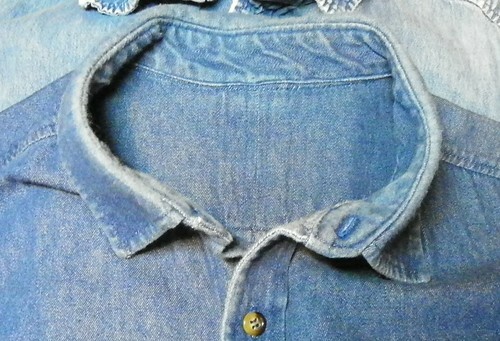 I have looked for a denim to match this first 20 yards but can’t find anything comparable. I think I bought it through the Fabrics and Notions coop and know nothing technical about the weight or source. but wear showed after the first wash on the all parts where the fabric was folded. This shirt is now only 2 years old and it doesn’t look much better than the shirts that are almost 6 years old. It is worn very little, only for those days when he might have to look presentable outside of the factory. but see how it’s already to shred and needs to be replaced soon too. I will simply have to use what is in the stash and plan on making new shirts more often. 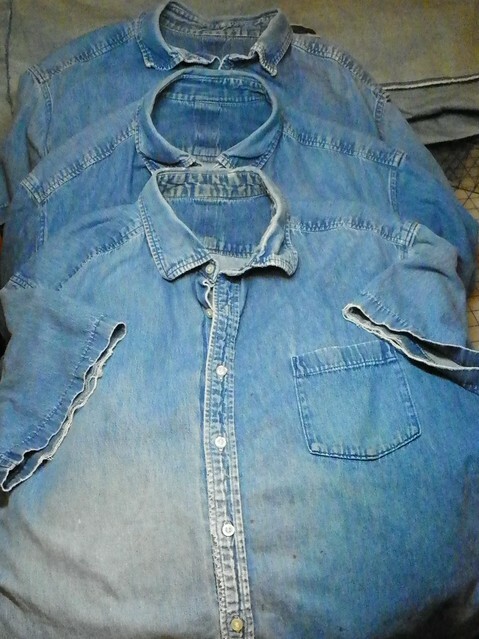 Maybe I’ll eventually luck out and find a good quality, medium weight 100% cotton denim. Anyone have any suggestions??? I can hardly believe this is the first button I will have had to replace. After all these years. 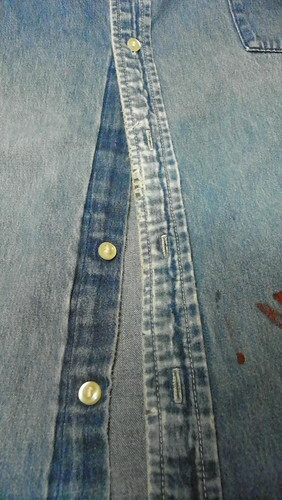 They were originally sewn on by machine, using a 1967 all metal White that I inherited from his Mother. Here it is in production in 2003. 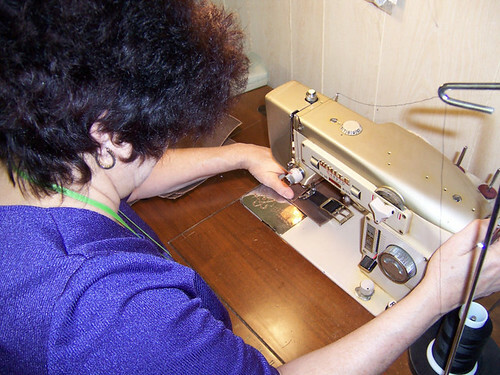 I used it in commercial sewing for years before I had to sell The Stitchery 2 years ago. I miss that machine. The foot lifted high enough that I could make thread shanks even as I machine sewed on the buttons. It sewed through Naugahyde and upholstery ultrasuede accurately and with ease. The feed was amazing. But things change all the time and even though Mr Stitch says it will be time for long sleeves soon, I doubt these shirts will last until December when the temperatures get seriously cold. 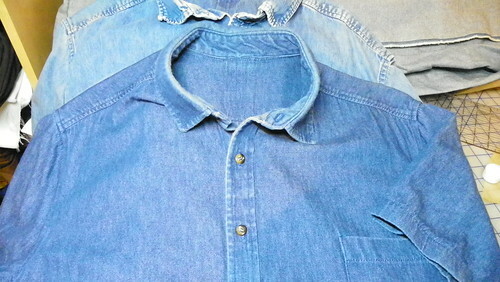 Move over Fall Fashion plans, it is time to cut at new short sleeved shirts. Posted in Fabric, Shirtmaking, Work Clothes, Work Shirts and tagged Sewing, Work Shirts. Bookmark the permalink. 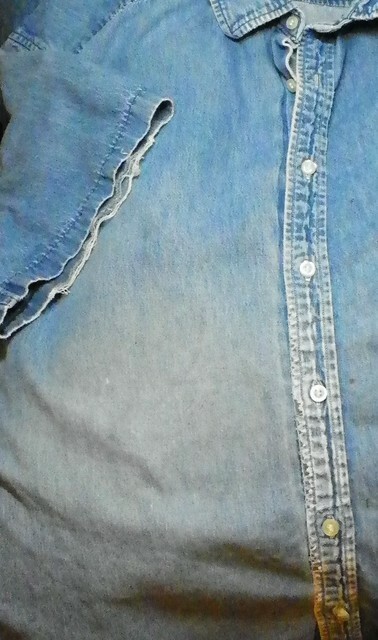 Maybe you could write to Ressie and ask if she remembers where she sourced that denim? Do you have any scraps that you could send off to various suppliers? Ah Elaine, all very good ideas. No scraps and I’ll write to Ressy, but I don’t even know what year it was cooped. She might have records. Thanks! Have you used this fabric, Beth? I’d love to hear what you did with it and how it preformed. Mary Beth, had much the same situation here when I caught DH trying to toss on a nice shirt over his tired and stained khaki shorts and wear them to church. They are also two years old and it’s time for new ones. Your work shirts are very nice and I’m sure the replacements will be equally as nice. LOL Theresa, when did we decide we wanted to do Man Dressing when we grew up? NEVER! But yet, there are standards to maintain and when it gets to chunks of thread and fabric hanging off then it’s time to get out the new stuff! Those look wonderful, what a compliment that they have lasted so long, and been so loved. Finding good denim is tough, but necessary. I have some jeans that are wonderful colors, but they aren’t all cotton and the texture isn’t quite what I would like. Perhaps you could talk to someone at Mood? They have several denims listed on their website, and they do send samples. Thanks, Becki, and you are right, good denim is hard to find! I think there might be a song in that last phrase. 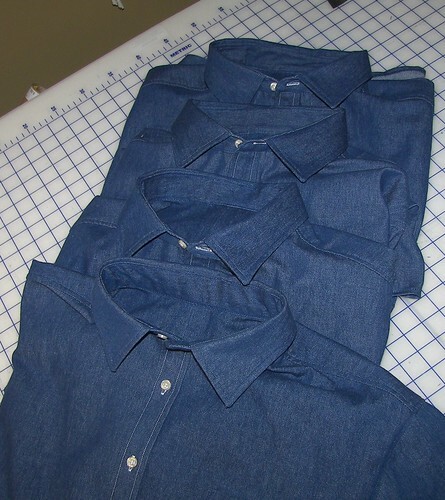 Can’t wait to see the new shirts you’ll make….your shirt-making skills are second to none…none! Maestra! How can you say that? What a great wife you are to make these custom shirts for your hubby. 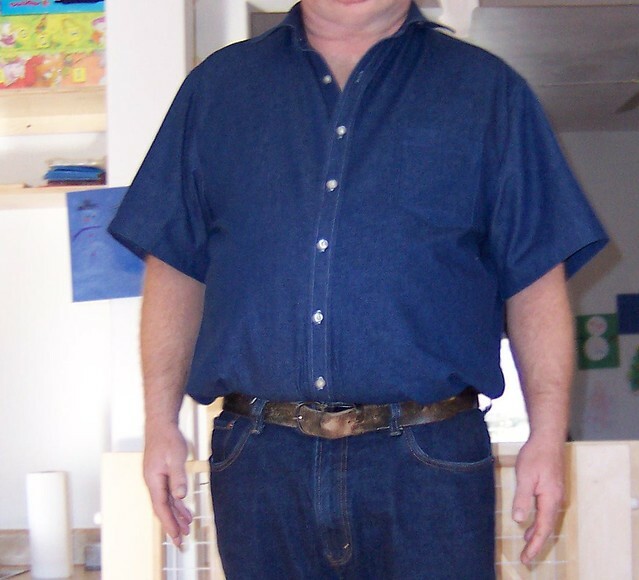 I might suggest looking into denim with a touch of polyester. The polyester will hold the color longer, and the fabric tends to hold up longer. I again commend your work.